Last week was a busy week at work and I had something to do every night so I took a little break from posting. But I'm back, and I've been busy. Last week I made pinto beans with canned beans so I would have something to take to work for lunches. I think I've been making them from scratch for so long now, though, that I could really tell the difference when I used canned and they were mushy. I took them to work for two days, but by the third day I just didn't have it in me to bring them again. I had half a bag left over from the three dozen corn tortillas I bought a couple of weeks ago that I had thrown into the freezer so I took some out and defrosted them, cleaned out the skillet, and heated them up. I had just a couple of pieces of that ten-year-old super sharp super tasty cheddar cheese I got at the green market around, so I crumbled those up and put some in between two tortillas (kind of like a grilled cheese sandwich), then made refried bean tacos out of the cheese-stuffed tortillas. 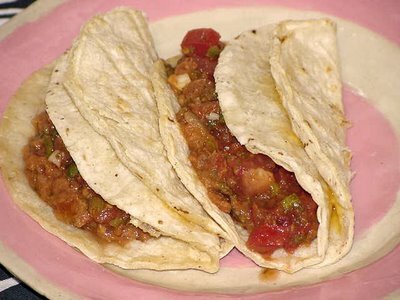 To top them off (literally), I had just a little bit of salsa in the fridge that I had made with the serrano peppers I got at the green market. This Saturday Lynda and I met up at the Green Market again. I bought lots of goodies but I haven't done anything with them yet. Tonight I finally used up the rest of the mole I made a couple of months ago with some pork chops I got at the Big Apple. I also have some cubed chicken marinating in a yogurt-tandoori masala mixture. More on that later. Today I went down to UIC and had lunch with my friend Bob at Joy Yee's Noodles, of which my friend Kevin has been frequently writing on Consumatron. And with good reason. More on that later, too. I use canned pinto beans for refried beans. I saute an onion, green pepper, garlic, in olive oil, add lots of cumin, and then the beans, that I crush with a potato masher when cooking. It's even better when I pour a little beer in the pan. I think I found the recipe in the first Moosewood Cookbook (without the beer). I make it a lot as a side dish.